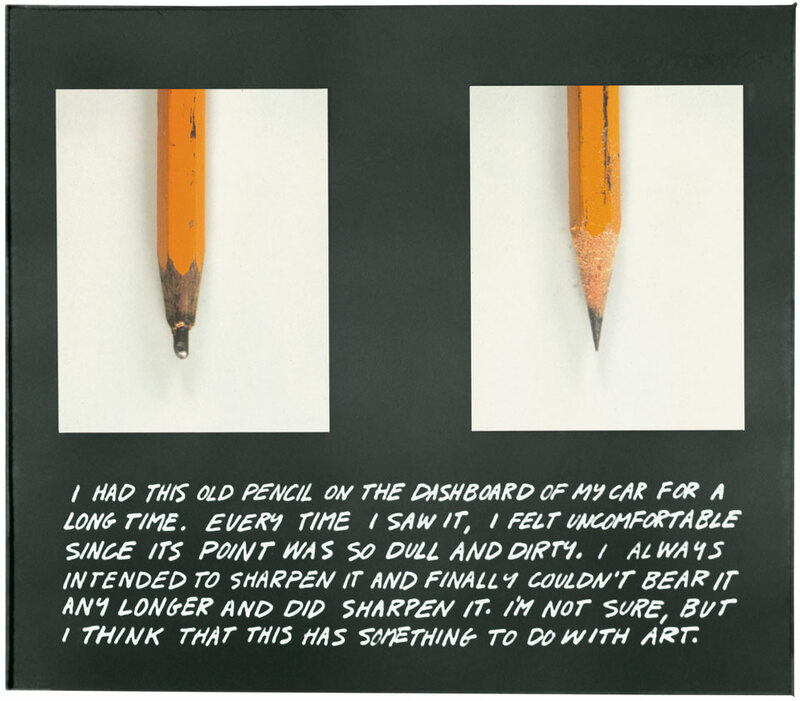 The work comprises two photographs of what we are told is the same pencil, side by side, before and after being sharpened. 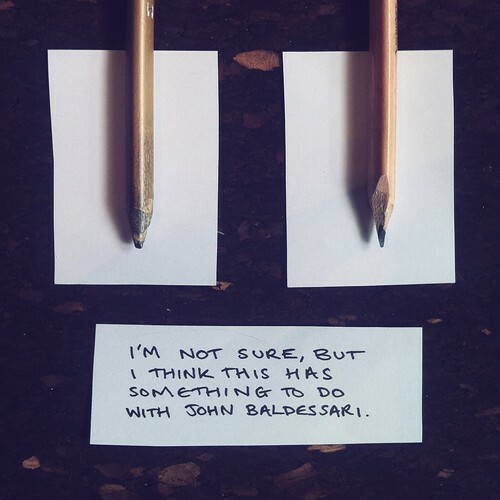 Underneath the photos, hand written in white ink directly onto the black paper that they are mounted on, is a short text about Baldessari’s relationship with the pencil. The work’s composition suggests a ‘scrap book’ style, the photos aren’t uniform, they don’t appear straight, the text is hand written and all in capital letters. There’s something about the writing, though, that doesn’t feel as authentically scrap book as a first glance suggests. Although the style of the text seems like a quick note it differs from genuine rough note style in that the text is very neat. The lettering is clear, and the letter shapes are rather consistent. Each sentence is roughly the same length, suggesting that the time and planning were involved. The text records the performance between the taking of the two images. The pencils in the photos face lead-point down, and although the edges of the photos are not mounted straight, the pencils in each are straight in relation to the black mounting. The point of each pencil is exactly the same length from the bottom border and both in the same placement slightly closer to the left photo. The photos illustrate the story. The pencil on the left is un-sharpened with a ‘dull and dirty’ point, the image on the right shows the newly sharpened pencil with a clean sharp lead. There is a balance, careful placement of each component creating a visual that to the eye looks a little like a page from a sketch book but following careful and time tested rules of composition. Baldessari gives the viewer all the visual clues to read this as a quick sketchbook-style page, creating a very authentic story, the story ending “I’M NOT SURE, BUT I THINK THIS HAS SOMETHING TO DO WITH ART” further suggesting to the viewer that this wasn’t intended as a finished work of art to be viewed in a gallery. This piece literally questions itself and creates an interesting parallel to the ideas behind the ‘readymade’ and the authority of the ‘artist’ and the gallery. Here is a piece I recreated as a post to social media site Instagram in response to this work.